Quote Jonathan Drew: MUWAT "BAIT FISH", is a 4x44 in the MUWAT "EF" Collection. The EF represents Fuerte due to the increase in strength from the other BAIT FISH blends that we worked on AND the regular 60 RG collection that the brand is released in. Please remember that the MUWAT brand itself, as originally released, is supposed to be truly medium bodied (seems to be a bit over medium). So when we began working on the BAIT FISH samples the blend was tweaked up from the beginning, to "M" and "F". The finished blend that was selected was the F, so I thought it would be logical to call this SPECIAL, EXCLUSIVE selection "EF" cause its got Extra from the Original MUWAT. 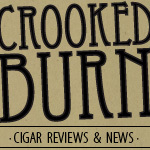 As I was introduced to Dan at NHC at this year's IPCPR we were able to spend a little while getting to know each other a bit better. I have been watching him as a truly passionate retailer and one who prides himself on good quality, special cigars in a boutique environment - I offered Dan the Exclusive for BAIT FISH. He seemed pretty jazzed about the concept, and we began to review blends. I'm looking forward to the introduction of the 4x44 into the MUWAT line just as the weather gets cold. It should be 30 to 40 minutes of happiness for the people in the freezing areas. I hope that some of you guys enjoy them. Now that we know more about this release, let's move onto the review to see how it held up. Before I begin the smoking experience portion of the review, I want to mention the packaging for this release because it would be a shame to not at least touch on it. 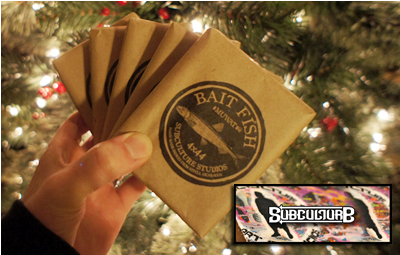 These sticks come packed in 5 count paper-wrapped bundles with the Bait Fish logo screen printed on the front. The design is so simple, yet comes off truly creative and different from what you would normally get in a premium cigar release. The pack is the perfect size to stick in a shirt or pants pocket, so carrying them to the park or while walking the dog will be a breeze. Kudos to Subculture Studios for the great packaging design. The cigar itself had a very dark wrapper with an oily sheen to it. There was really only one visual line on the stick and it was from the edge of the wrapper leaf. Squeezing the body of the cigar, I could tell it was evenly packed but not tight or anything close to hard. The pre-lit aroma was of fresh tobacco which reminded me of the smell of a rolling floor at a cigar factory. The cold draw was sweet with hints of cedar and nuts. 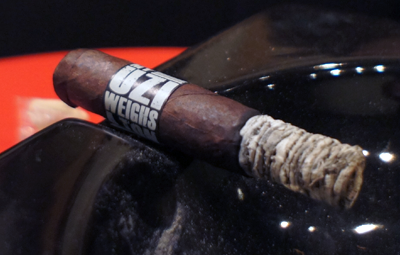 The first thing that came to mind a few puffs into my Bait Fish was just how smooth the start of the cigar was. I normally smoke a lot of black peppery sticks that sort of hit you in the face right away and that was not the case here. It was very relaxing and an easy to smoke start. The main flavors I picked up were oak notes on the front, mixed with some warm cinnamon spice on the finish. The cinnamon was most noticeable on the roof of my mouth. The cigar tasted very clean and didn't leave any film on my teeth or tongue. 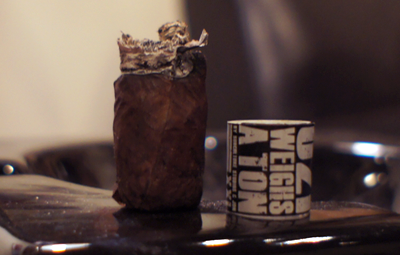 The burn and the draw were great and it was easy to pull large amounts of smoke, which was nice from such a small vitola. I would put the strength of the cigar in a solid medium. 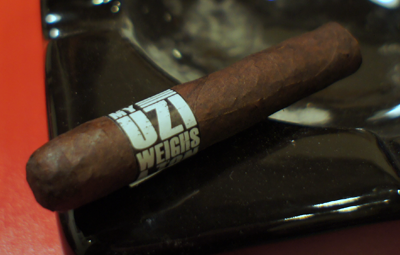 The second half of my Bait Fish is where the strength that is advertised in the promos for this cigar started to show. It was not a knock your head of strong nicotine buzz, but it was significantly stronger than the first half. The flavors of the second half also changed up and I finally got a taste of what many others have written about but I had never experienced before...I would say the main flavor now was very meaty and dark. It was so meaty that I almost felt like I should be able to chew the smoke. Again this is a new taste for me, so I'm not that well versed in describing it. I'm sure some others who pick this up a lot will have a better way of putting it, but I will say I was enjoying it. This flavor was dominant both on the front and the finish, but even with such a strong taste, the finish was very clean. I smoked this cigar all the way to the nub and it never got hot which is what I normally experience in small sticks at the end. Full strength now. My final thoughts on the MUWAT BAIT FISH by Subculture Studios? I was like a lot of other people with the original MUWAT release in that I liked it, but wished it was smaller and a bit stronger. Well that is exactly what the Bait Fish was, with the meaty flavor added in as a twist. If you're a fan of the MUWAT line you are going to love this. For this time of year, when the weather is cold up here in Ohio, this is a perfect smoke. Would I buy it again? This is going straight into my small winter cigar rotation. I will be buying a lot more of these. Would I buy a box? Bundles of 25 sticks for $130 bucks? This is a no-brainer to me. I will grab more than one bundle. Side Note: These are a New Havana Cigars exclusive release and will go on sale this Wednesday, December 7th in the evening. I'm not sure what the special is, but Jonathan Drew and Dan Welsh (owner of NHC) told me that there will be some sort of promotion pack that will come with these cigars on release day. 50 promotion packs were available when they went on sale at 7:00 pm EST. Now long gone. Promotion = Hat and 4 Undercrown and JdN cigars.